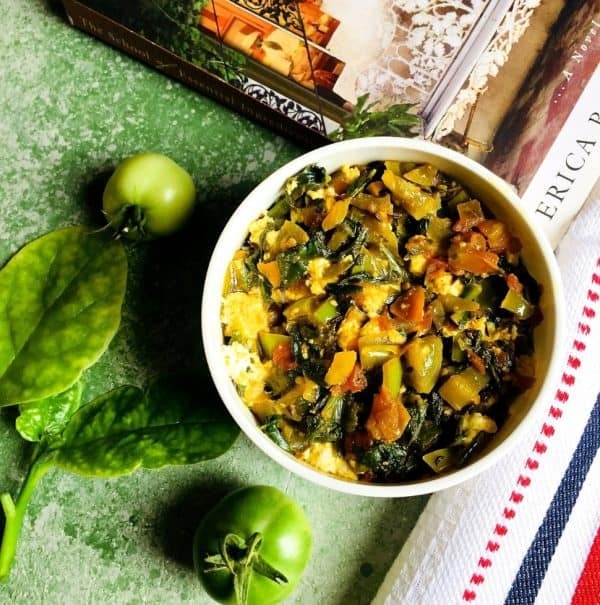 The plan originally was to make the mooli palak ka saag with radish greens and spinach, but the Malabar spinach / basale soppu/ pui shak being readily available, I opted for it instead. 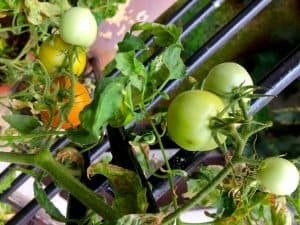 My balcony garden also had three tubs of tomatoes with gorgeous little green tomatoes, a few of them ripening to shades of orange. 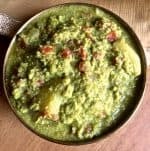 Instead of the red tomatoes that I add to palak or mooli saag, a half a dozen of the green tomatoes and some of the orange ones got into the ingredients list for this recipe. There is something fresh and tasty about green tomatoes. Just a little tart, just a bit sweet, they have a unique flavour and add their firm texture to the saag. 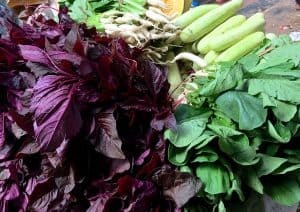 My recent trip to Goa included a visit to the amazing huge hall of vegetables at the Panjim Municipal Market. I picked up some that I don’t normally see at Bangalore, and also a bagful of lovely little white radishes with their bunches of greens. I was not able to cook the radish greens as soon as I returned, and after 3 -4 days they were beginning to wilt, and some had turned yellow. I rescued the ones that were still fresh, and set about making the Radish Greens Spinach Curry. 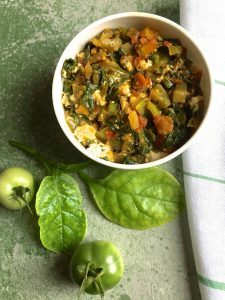 Palak / Spinach can be used instead of the Malabar spinach, and red tomatoes if green are not available. 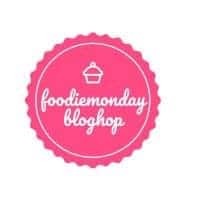 The theme for the 171st Foodie Monday Blog Hop is SaagSaga. The theme was suggested by Kriti Singhal Agrawal as a follow up to her theme of the previous week. All of us were interested in cooking with winter greens and we had a robust discussion (on WhatsApp!) as to what exactly is saag. 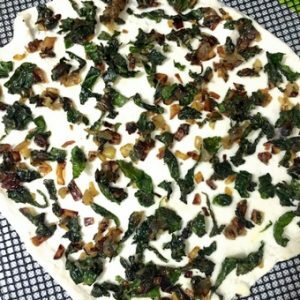 Some of us felt that any cooked greens would be included. Some others that we could cook leafy greens to which other items such as chicken or potato could be added. Not a rice dish or soup or stews etc. 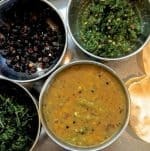 I had planned another dish and actually made it too, but once the theme guidelines were firmed up, changed tracks and prepared the Radish greens spinach curry or mooli palak saag as a fitting tribute to winter greens. Separate the leaves of the radish greens and spinach from the stalks. Keep tender stalks and discard the tough ones. Shred or slice the leaves, rinse and then dry them in a salad spinner or pat dry with a kitchen towel, gently squeezing out as much water as possible. Slice onions and tomatoes into small even sized pieces, mince the ginger, chilli, crush garlic, and shred the curry leaves. Add the garlic and sauté till the cloves begin to change colour (about 1 minute) and add ginger slices. Sauté for another minute. Add the onions, sauté for 2-3 minutes till well done. Add the tomato slices, stir well and add the turmeric, coriander and mango powders. Stir again and sauté for about 5 minutes till the tomatoes shrink in size. Add the radish greens and Malabar spinach/ spinach leaves. Stir well and sauté for 5 minutes on low heat, stirring frequently. Add a little salt, stir and check the taste, adding a little more if required. Add crumbled fresh paneer (if using) and stir. Remove from the heat and transfer to a serving dish. 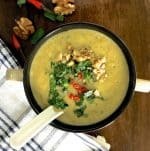 Serve hot with roti or with rice and dal. Radish greens and Spinach makes an amazing combo. It feels so good when you harvest veggies from your home garden.Fab share for the theme. Thank you, Preethi Prasad! It does! I love the way you have picked out each bit from your garden to add up to the vegetable loot from Goa. 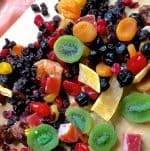 There are so many elements going on in your dish, it should be so yum. Thank you Seema! This season makes me want to cook with all the fresh produce every day! Thank you Veena! Yes I’ve learnt quite a few ways of making Saag from this theme! Loved the description of your kitchen garden. Please share a picture with us. 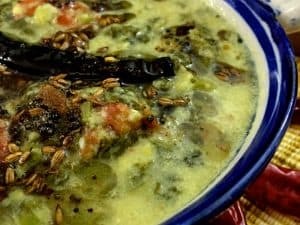 Mooli ka saag looks so tempting comforting and healthy. Awesome share. Thank you, Sujata! Will share pictures of my herb garden soon! Thank you so much! Its such a pleasure to be able to cook from ones garden, isn’t it! What a lovely kitchen garden you have di ! Can imaging how flavorful your curry must have tasted with all those fresh green timattom going in. Never tried radish green and spinach like this in a curry. But now would love to give it a try . Thanks for the share. I’ve seen Malabar spinach in Bangalore and didn’t know what it is used for, now I do. Love your balcony garden, and you’re so right anything can grow in the Bangalore weather. Making a saag with radish and spinach leaves along with green tomatoes….is like wow… so tempting and nutritious. Wowyou grow your own veggies! I love the thought but me I will not. Its way too much work! I however will love to try growing the Basale saup. It is sure delicious. The sue of radish leaves too is innovative. Imust try making this saag. Thank you! 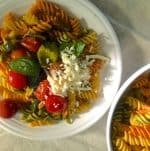 Not all veggies, just herbs like basil, rosemary, parsley etc, tomatoes and the spinach. I’ve just planted cherry tomato seeds, hope they will come up well! Thank you so much, Priya! Glad we have similar tastes in Food Books! I loved reading through the story, your fascination for growing produce at home sounds very similar to me. though, after shifting to our new place, I have not found the time to start my balcony garden but now the post here, inspires me. The Panjim Market greens looks so pretty. Now coming to the dish, loved the combination of ingredients used to create a hearty, healthy and wholesome saag. Thank you so much, Vidya. Bangalore weather makes growing herbs and greens a pleasure. And Im happy that I can just pluck what I need from my garden instead of buying them and not being able to use them. This dish is going become a staple in my kitchen, Im sure!